American actor, singer, dancer, and comedian (born January 18, 1911, Brooklyn, New York, USA - March 3, 1987, Los Angeles, California, USA). Kaye was born to Ukrainian Jewish immigrants on January 18, 1911 (though he would later say 1913). After dropping out of high school he worked for a radio station and later as a comedian in the Catskills. After his solo success in the Catskills, the young Kaye joined the dancing act of Dave Harvey and Kathleen Young in 1933. Throughout the late 1930s Kaye went out and performed on his own—often with material written by his wife, Sylvia Fine. In 1939 Kaye made his Broadway debut in “The Straw Hat Revue." Later that year his comic singing was featured in “Lady in the Dark,” in which he sang the names of 54 Russian composers in thirty-nine seconds in a song called “Tchaikovsky.” Throughout the early 1940s he performed night club acts, on Broadway, and to support the troops overseas during World War II. From 1945-46 Kaye starred in a radio program, "The Danny Kaye Show," on CBS. The cast included Eve Arden, Lionel Stander, and Big Band leader Harry James (2), and it was scripted by radio notable Goodman Ace and playwright-director Abe Burrows. Though Kaye made his film debut in 1935, it wasn’t until almost ten years later that his film career hit its stride. His feature film debut was in the 1944 comedy "Up in Arms." Throughout his career he starred in seventeen movies, including "The Kid from Broadway" (1946), "The Secret Life of Walter Mitty" (1947), "The Inspector General" (1949), "Hans Christian Andersen" (1952), and "The Court Jester" (1956). In 1954 Kaye began his long-standing association with the United Nation’s Children’s Fund (UNICEF), and that same year won a special Academy Award for his humanitarian work. Throughout the late 1950's and early 1960's Kaye continued to work in the movies and in 1963 had his own television show. 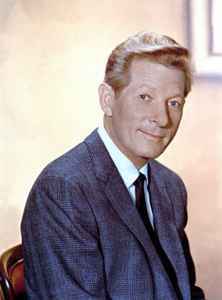 The Danny Kaye Show ran for four years and was a hit, winning an Emmy in its first season. Though Kaye's work slowed in the 1970's and 1980's, he continued to give charity performances and made select appearances for television and film.